Dürnstein is a small quant town along the banks of the Danube river. 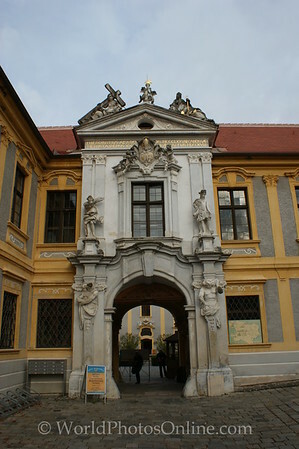 The main claim to fame is Dürnstein castle and Dürnstein Abbey. Dürnstein castle overlooks the town and was where King Richard I Lionheart of England was held captive by Duke Leopold V of Austria after their dispute during the Third Crusade. Apparently Richard had personally offended Leopold by casting down his standard from the walls at the Battle of Acre. Duke Leopold was excommunicated by Pope Celestine III for capturing a fellow crusader. The duke finally gave the custody of Richard to Emperor Henry VI, who imprisoned him at Trifels Castle. All that is left of castle now is ruins. We did not visit Dürnstein Abbey but it has a beautiful blue church spire done in the Baroque style.